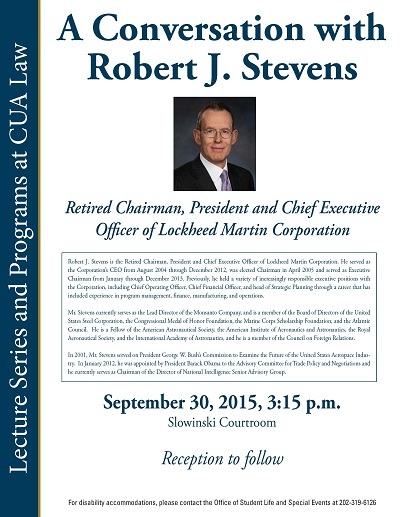 On September 30, 2015, Mr. Robert J. Stevens, former Chairman, President, and Chief Executive Officer of the Lockheed Martin Corporation and current Lead Director for the Monsanto Company, sat down in a less formal setting with Dean Daniel F. Attridge and an audience of aspiring CUA lawyers. The purpose of this conversation was to reflect on his experience as well as offer tips and insight to law students as they enter into practice and into leadership positions across this country, in various fields and sectors. Stevens, Robert J., "A Conversation with Robert Stevens" (2015). Other Lectures & Events. 4.